A fascinating, beautifully illustrated guide to the monsters that are part of our collective psyche, featuring stories from the Lore podcast—now a streaming television series—including “They Made a Tonic,” “Passed Notes,” and “Unboxed,” as well as rare material. They live in shadows—deep in the forest, late in the night, in the dark recesses of our minds. They’re spoken of in stories and superstitions, relics of an unenlightened age, old wives’ tales, passed down through generations. Yet no matter how wary and jaded we have become, as individuals or as a society, a part of us remains vulnerable to them: werewolves and wendigos, poltergeists and vampires, angry elves and vengeful spirits. 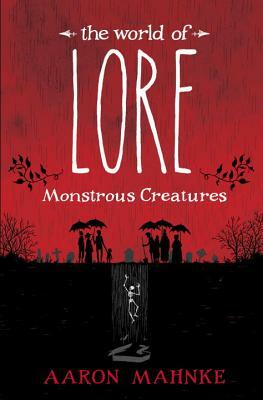 In this beautifully illustrated volume, the host of the hit podcast Lore serves as a guide on a fascinating journey through the history of these terrifying creatures, exploring not only the legends but what they tell us about ourselves. Aaron Mahnke invites us to the desolate Pine Barrens of New Jersey, where the notorious winged, red-eyed Jersey Devil dwells. He delves into harrowing accounts of cannibalism—some officially documented, others the stuff of speculation . . . perhaps. He visits the dimly lit rooms where séances take place, the European villages where gremlins make mischief, even Key West, Florida, home of a haunted doll named Robert. In a world of “emotional vampires” and “zombie malls,” the monsters of folklore have become both a part of our language and a part of our collective psyche. Whether these beasts and bogeymen are real or just a reflection of our primal fears, we know, on some level, that not every mystery has been explained and that the unknown still holds the power to strike fear deep in our hearts and souls. As Aaron Mahnke reminds us, sometimes the truth is even scarier than the lore. Aaron Mahnke is the writer, host, and producer of Lore, as well as the author of a number of supernatural thrillers. His deep love of the mysterious and frightening began with Unsolved Mysteries and The X-Files—and it’s a love that continues to this day. Basically, he’s a nerd for anything inexplicable or supernatural. Mahnke lives with his family in the historic North Shore area of Boston, the very heart of Lovecraft Country and the Salem witch trials. Copyright ©Yankee Bookshop - If you need assistance with this website, please contact us.